Dr Keske's research focuses on the effect of pharmacological and nutritional interventions that can help prevent insulin resistance and type 2 diabetes by regulating microvascular blood flow within muscle. Obesity, hypertension and type 2 diabetes, which are increasing to epidemic proportions in Australia, are major risk factors for cardiovascular disease. A common feature of these conditions is insulin resistance which is characterised by impaired insulin-mediated glucose metabolism in muscle. Dr Keske's research has shown that microvascular function in muscle plays an integral role in blood glucose regulation. Insulin increases microvascular perfusion in muscle to facilitate access of glucose and insulin to the myocyte to enhance glucose disposal. Impairment in insulin-mediated microvascular perfusion in muscle can lead to insulin resistance and type 2 diabetes. Dr Keske has been a dedicated researcher in the diabetes and cardiovascular disease field for the past 15 years. 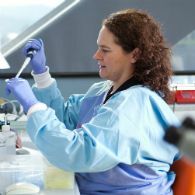 She received her PhD from the Diabetes Research Group (formerly known as the Department of Biochemistry), University of Tasmania in December 2000. During her PhD she had the opportunity to work as a visiting scholar at the University of Washington, Seattle, WA, USA. She completed 8 years of international post-doctoral training at the University of Virginia, National Institutes of Health, and Industry in the USA. In 2007 she was recruited to join the Menzies Institute for Medical Research. She now leads a research group studying novel pharmaceutical and nutritional interventions that have the potential to prevent or reverse vascular defects in patients with diabetes and cardiovascular disease. Dr Keske's research aligns to the University's research theme of Better Health. Obesity, hypertension and type 2 diabetes, which are increasing to epidemic proportions in Australia, are major risk factors for cardiovascular disease. A common feature of these conditions is insulin resistance which is characterised by impaired insulin-mediated glucose metabolism in muscle. Dr Keske is researching into the vascular causes and consequences of insulin resistance. She is working on targeting the vasculature in skeletal muscle as a novel treatment target for preventing or reversing the development of insulin resistance. Can drinking blueberry tea improve metabolic and vascular health in people with type 2 diabetes? Dr Keske has published 51 papers (14 as primary author, 9 as senior author) over the course of her career in highly recognized, internationally peer reviewed journals such as Diabetes, Diabetologia, Diabetes Care, JACCI,Cardiovascular Research. Her research has been cited >2,300 times (H-index = 20) and many of her publications are rated as highly influential (9 cited >100 times; 3 cited >200 times; 1 cited >300 times). Since 2008 Dr Keske has obtained $3.3M in competitive grant funding to support her independent research program. $1M Quantum Leap Fellowship; $390k ARC Discovery Grant; $1.4M NHMRC Project Grants; $129k Heart Foundation Australia, $100k other local Tasmania Funds. People with type 2 diabetes are four times more likely to have a stroke. Interestingly, common anti-diabetic drugs seem to improve patient outcomes following a stroke. This project will determine whether anti-diabetic drugs improve brain blood flow dynamics during and after stroke to reduce stroke severity in an animal model of type 2 diabetes. The oral glucose tolerance test (GTT) is the gold standard for assessing pre-diabetes and type 2 diabetes (T2D), and is used world-wide. However, our researchgroup has made an important discovery demonstrating the GTT causes acute microvascular insulin resistance in healthy people. These findings have asignificant clinical impact as it implies that the GTT does not have the sensitivity to identify people with vascular-derived insulin resistance which is one of theearliest events in the development of pre-diabetes. Therefore, people with vascular‐derived insulin resistance are not being identified or diagnosed. We have developed an alternative test (the mixed meal challenge; MMC) and hypothesise it will have greater capacity to screen for pre-diabetes.Aim 1: Determine whether the MMC can identify pre-diabetes in a population of people that would otherwise be considered healthy in response to a GTT.Aim 2: Determine whether the benefits of the MMC as a new diagnostic test is linked to microvascular insulin sensitivity in skeletal muscle. Offspring from type 2 diabetics (T2D) are at much greater risk of developing diabetes than a person with no family history. The mechanism for this increase in risk is not known. This project will determine whether microvascular dysfunction in skeletal muscle and skin of first degree relatives with T2D occurs before development of insulin resistance. We will recruit people with and without family history of T2D. It will measure microvascular actions (using ultrasound) in these people before and after a mixed meal challenge. The outcomes of this study will determine whether monitoring microvasculature responses in muscle is an important 'early' strategy for assessing risk that might inform patient treatment to prevent or delay progression to insulin resistance or T2D. This project will recruit an overweight type 2 diabetes cohort, medically assessed for an exercise program. It aims to recruit some with family history of type 2 diabetes and some without. The cohort with exercise test before and after 6 weeks of the exercise program, with type 2 medications discontinued before test. The aim is to show that heart health will not be as good with family history of type 2 and that exercise will improve heart health but will be of more benefit to those with a family history than those without. The overall aim of this project is to investigate the impact and to contribute to the evidence base for anthocyanins as a functional food. Obesity and type 2 diabetes are nationally and globally reaching epidemic rates. This project investigates the regulation of blood flow within muscle and its impact on metabolism. Outcomes from the study may lead to diagnostic tools and treatments for cardiovascular disease associated with obesity, hypertension and type 2 diabetes. Since 2008 Dr Keske has supervised 2 post-doctoral fellows, 1 research assistant, 4 PhD and 11 Honours candidates (current supervision 1 post-doctoral fellow and 3 PhD candidates).